Led by first-year point guard Marcus Carr’s perfect shooting performance, the Pitt men’s basketball team managed to avoid another home upset — escaping with a 71-63 win over High Point University Tuesday night. The Pitt Panthers (3-4 overall) did not score a field goal in the final four minutes of its matchup against the High Point University Panthers (2-4 overall) — but it didn’t matter, as the host team made all 16 of their free throws in the last three minutes to secure an eight-point victory. Playing in front of a record-low Petersen Events Center crowd of 2,399, Pitt’s efficient shooting — 55 percent from the field, 42 percent from beyond the arc and 86 percent from the free-throw line — just barely made up for the team’s season-high 22 turnovers. Pitt started out lackadaisical against its Big South opponent, trailing 7-2 after turning the ball over three times in the first three minutes. But after Carr drawn a charge and hit a 3-pointer, the Panthers stifled their opponent’s early momentum and tied the game at 7. Pitt took its first lead of the game when junior Jared Wilson-Frame made a 3-pointer — marking his eighth straight game sinking one — to make the game 12-9. The team then found its rhythm, taking advantage of a five-minute High Point scoring drought to go on a 7-0 run. First-year Shamiel Stevenson capped off the offensive burst with a ferocious dunk that fired up the Oakland Zoo and gave Pitt a 19-9 lead. The two teams traded baskets for the next few minutes, but a flurry of Pitt miscues toward the end of the half allowed High Point to go on an 11-2 run. By the half’s end, five Panthers had committed a turnover. Senior Ryan Luther was the primary offender, coughing the rock up three times in the half. Despite the offensive miscommunications, Pitt led High Point 30-27 after one half. Carr led the team in scoring with 10 points, including a perfect 4-4 from the field and 2-2 from the 3-point range. Pitt came out strong in the second half and cracked open another double-digit lead, 41-31, after 3-pointers by Luther, Carr and Wilson-Frame. Carr’s basket was his 13th point of the night, surpassing his previous single-game record of 12 points. But after High Point began to full-court press, Pitt faltered once again. The Panthers succumbed to the pressure, turning the ball over four times and allowing their opponent to cut the deficit to just one point — 44 to 43 — with 10 minutes remaining. The game’s final frame looked to be a stalemate, as neither team could take a sizable lead. But Pitt’s lone veterans led the Panthers down the stretch, with seniors Luther and Jonathan Milligan each converting two critical free throws in the last two minutes to pull ahead 59-55. After High Point missed two more shots and began to foul, Pitt iced the game from the free-throw line, going a perfect 16 of 16 in the closing minutes to win 71-63. Carr was the star of the night for Pitt, shooting a flawless five for five from the field — including three from 3-point range — and six for six from the charity stripe en route to a career-high 19 points. Luther, Milligan and Wilson-Frame also scored double digits for the Panthers. Luther’s 15 points marked the sixth time in Pitt’s first seven games that he cracked double digits, and he also led the team with eight rebounds. 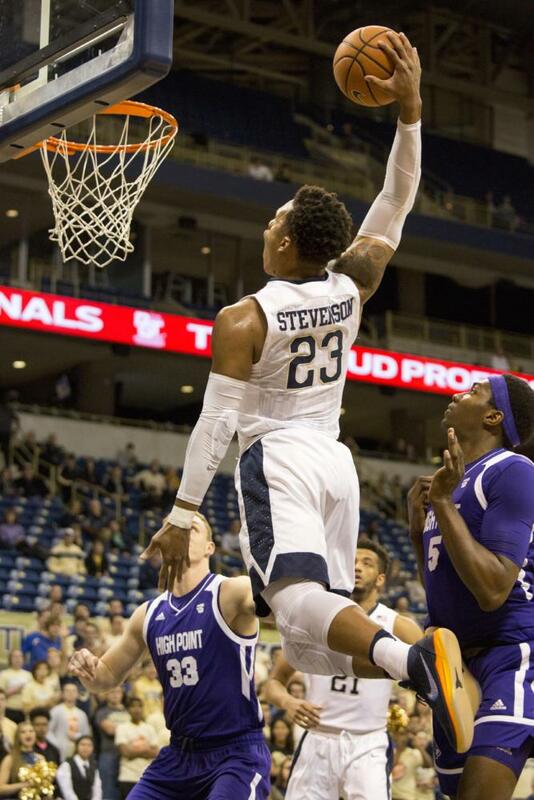 Pitt will seek to even up its season and avenge last year’s loss as it takes on Pittsburgh rival Duquesne in 86th City Game at PPG Paints Arena Friday. Tipoff is at 7 p.m.